Course Website: Official Website - Visit Apple Tree Resort's official website by clicking on the link provided. Accolades: Ranked 20th in Washington on Golf Course Gurus' Best in State list. 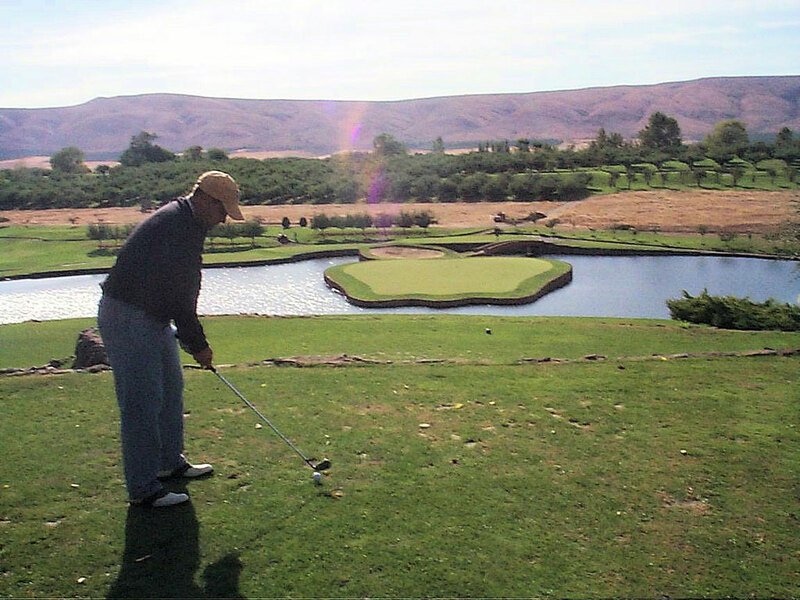 What to Expect: Apple Tree Resort is a public access course with on-site accommodations located in the fertile apple valley of Yakima, WA. The course is cut through an apple orchard and embraces everything apple! 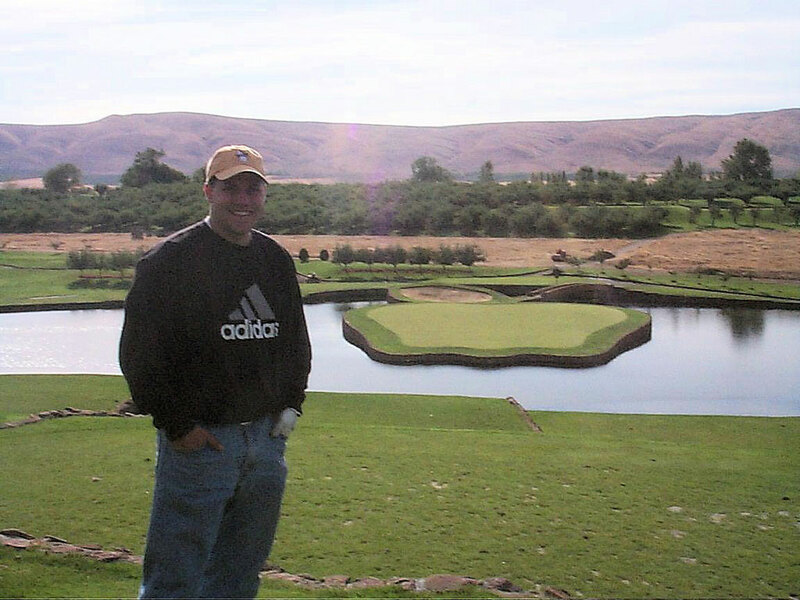 From the apple shaped logo, to the apple shaped bunkers, to the apple shaped island green, this Washington track has a consistent theme from start to finish. To this day, the best apple I had in my life was one I took off the tree on a cool October morning at Apple Tree. Apple juice gushed out on my face as I pierced the surface with my teeth; it was amazing! The course features several water hazards and features some residential housing on the back nine. The course may not compete in greatness with the offerings on the west side of the state but is a must play in Central Washington. Signature Hole: 17th Hole – 180 Yard Par 3 – If you looked up the definition of what a signature hole is, the 17th green at Apple Tree could very well be used as the perfect example. Similar to the floating green at Coeur d’Alene’s Resort course, the first thing out of a player’s mouth when talking about Apple Tree will be the apple shaped green surrounded by water found at the 17th hole. Shaped like the iconic Washington fruit, the stem is a bridge leading back to land while the leaf shaped bunker finishes off the artistic rendition. Best Par 3: 17th Hole – 180 Yards – Wisely, the design of this course saved the most anticipated shot of the day for near the end of the round. The tee shot plays downhill to a large apple shaped green fully equipped with a stem and leaf (bridge and bunker). The uniqueness of this Washington state inspired design makes it one of the most memorable shots that you’ll ever hit. Best Par 4: 9th Hole – 420 Yards – Apple Tree's 9th hole features in front of the tee box that then works its way up the right side of the fairway while a pair of fairway bunkers are featured up the left. The more you are willing to gamble with the water the more yardage you can cut off of this hole while also creating a nice angle into the green. If you see two flags, don't think that you are seeing double; it's just the 18th flag at this shared green that is protected by bunkers on each side. Best Par 5: 18th Hole – 506 Yards – Apple Tree's final hole presents a great risk/reward opportunity as it climbs up the hill towards the clubhouse. Going right is the safer play as it takes the water out of play, but brings a fairway bunker into play with a monster drive. For your best chance of reaching the green in two requires going up the left side of the hole where a finger of the fairway cuts back into the lake that covers the left side of the fairway. Landing on this peninsula fairway will leave you less than 200 yards into the green and should generate more confidence on your approach shot that will require an aerial uphill shot that carries the creek that crosses the fairway short of the green while also carrying the red sand, apple shaped bunker protecting the putting surface. Approaches that land short face the possibility of running down the fairway and back to the creek in firm conditions. Birdie Time: 13th Hole – 149 Yard Par 3 – If water is a major factor on a hole, I generally wouldn't consider it a great birdie opportunity, but when a par three is under 150 yards you should be salivating at the chance to knock one close and take a stroke back from old man par. Thought Apple Tree's 13th hole features water on the left side of the green, the putting surface is large, the distance short, and the lie is perfect; all excellent factors when going for a birdie. Bogey Beware: 4th Hole – 461 Yard Par 4 – Clearly the most difficult hole on the course, the 4th hole at Apple Tree is demanding from start to finish. The hole doglegs right and features a bunker on the inside corner ready to gobble up tee shots that don't fly at least 280 in the air while trying to shorten the beast. The green is severely elevated and sits at a 45 degree moving from front left to back right and features bunkers long and short of the shallow portions of the green. The purtting surface is one of the most undulated and difficult greens to roll the rock on; a par here is a rewarding experience.